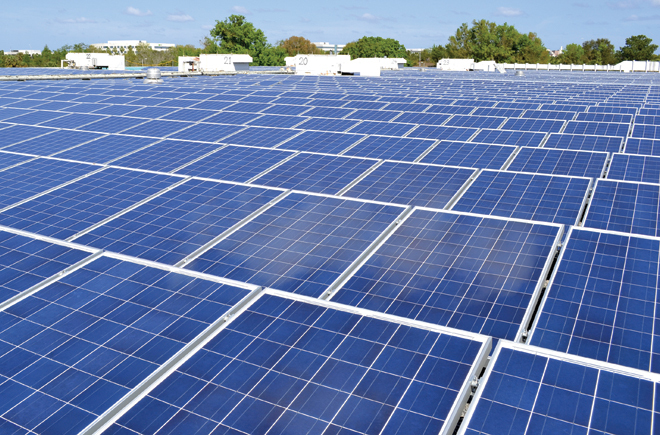 Bluechip Energy has taken solar power to heart, installing the largest privately-owned rooftop plant in the state of Florida to provide power to its solar PV panel manufacturing plant and corporate offices. Bluechip Energy has found a very powerful use for its 318,000 square feet of rooftop: it's now stage one of the Rinehart Solar Farm. The 1.4 MW Rinehart power plant has eliminated the monthly electric bills for the entire company, saving hundreds of thousands of dollars annually. The U.S. has literally millions of square feet of rooftops just begging to be used for something other than dust collection. Florida's Bluechip Energy (BCE) has found a use for its 318,000 square feet—stage one of the Rinehart Solar Farm. The power generated by the rooftop provides 100 percent of the energy needed by the company's manufacturing plant, Advanced Solar Photonics (ASP), as well as its corporate offices. 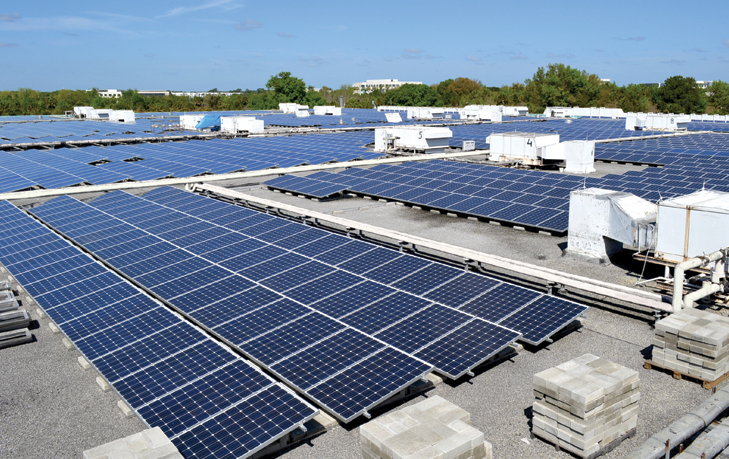 The 1.4 MW Rinehart installation is the largest privately owned rooftop solar plant in the state of Florida. The power plant has eliminated the monthly electric bills for the entire company, saving hundreds of thousands of dollars annually. The company, of course, already knew something about solar plants before embarking on the project. ASP is a manufacturing and R&D center for crystalline silicon solar photovoltaic (PV) panels for utility, commercial, and residential applications. Its roots go back to 2000, with the start of manufacturing laser cutting and laser marking equipment—which it still operates today. Laser applications for solar module manufacturing sparked the launch of ASP as a PV equipment manufacturer in 2009, and as part of a vertically integrated business model along the solar value chain, BlueChip Energy was created as a project developer and EPC. Today, BCE is unique in that it is a fully integrated solar PV power generator—from manufacturing to turnkey solar power plants. The company develops, finances, constructs, operates, maintains, and monitors solar PV plants. Manufacturing allows ASP to focus on high-efficiency, state-of-the-art solar PV modules ranging from 200 watts to 400 watts, as well as fabrication of mounting systems. "By 2012, ASP had expanded to become one of the largest producers of crystalline silicon PV panels in the United States and one of the few producers in the U.S. of Buy American Act-compliant products suitable for government, military, and municipal projects," says Lawrence Hefler, director of corporate marketing for the company. The Rinehart rooftop installation is just Phase I of a two-phase project. The second phase is an 8-MW ground mount system that will be operational in 2013. The enormous rooftop solar farm, however, has been operational since 2011 and has been saving the company thousands of dollars every month since the day it started up. The company's corporate offices and manufacturing plant rooftops were ideal for the project. The panels cover approximately 70 percent of the available square footage leaving some room for expansion. "It's a very large building—the equivalent of two Super Walmarts," says Ron Henson, project manager for BCE. "If we expand the roof in the future, we may be in the position to sell power on a monthly basis. But right now, it's pretty much meeting our own demands." Henson says the basic system components included ASP 240 watt PV panels, an ASP SunRail ballasted racking system, four 266 kW Solectria Renewable inverters, and two Fronius 60 kW inverters. All work to date has been completed by BlueChip Energy's own engineers, electricians, and installation crews. BCE wasn't able to tap any state tax incentives in Florida, such as those offered in states like New Jersey and California, but that just requires them to become economically creative. BCE prides itself on offering companies an economical alternative because of its vertical integration. On this project, however, the savings really mounted up as ASP not only manufactured its own panels and used its own crews, but also saved on transportation, with virtually zero transportation costs—moving the panels from inside the manufacturing facility to the rooftop. The Rinehart rooftop installation at Bluechip Energy is just Phase I of a two-phase project. The second phase is an 8-MW ground mount system that will be operational in 2013. The close proximity didn't affect workflow. Safety codes were followed, and access to the roof was through the industrial section so there was no mixing with the public space. "We had very short periods of downtime for the electrical connections—and none during the weekday," says Henson. Rooftop solar plants aren't for everyone, but this project has companies with large rooftops considering the option. "BCE is in the process of evaluating additional solar farm sites," says Henson. "We've had interest expressed from other manufacturers, hospitals, municipalities, and a variety of large roof facilities in Florida." Hefler adds, "In the past 12 months, we have been seeing an increase in commercial installations on a smaller scale—25 kW to 100 kW. There are many opportunities, though, for the one megawatt-plus installations for companies with big electrical consumption and large unused rooftop spaces." In fact, BCE just completed a 22 kW installation at Bright House Networks near Tampa, Florida. The company wants to expand it up to 110 kW in the future. "Utility companies in that area offer rebates each year, which helps bring down the initial installation costs," says Henson. Each rooftop installation has to be designed for the individual roof. Generally, an office building can support a larger load than a warehouse, but that's not always the case. BCE evaluates the load levels and the systems they can bear. Based on the findings, different systems are recommended. "You can have weighted ballasts or you can attach directly into the structural roof," says Henson. In Florida, it's not the weight or "dead load" that's the major concern, but uplift. "Obviously, we have to design for hurricanes," says Henson. "In Florida, we design facilities for winds from 110 to 160 mph." The price of solar panels has dropped dramatically over the past five years and will likely continue to drop for a bit longer, says Hefler, making projects like these possible for more companies, even without state or utility company incentives. "On commercial systems, a combination of the federal tax credit, depreciation, and the solar rebates of utilities means a return on investment can be seen in as little as five years," says Hefler. Now that the Rinehart Solar Plant is complete and interconnected, Hefler says one of the highlights is taking people on tours. "Because it's a 1.4 megawatt project and the largest on a Florida rooftop, people are impressed when they see what can be done," he says. "Rooftops are basically functional and under-utilized, but they're very valuable because they have the maximum exposure to sunlight, which is really what you want." Considering the southeastern region, and that it can get some wild weather, Bluechip Energy designs solar power facilities for hurricanes. In Florida, the company designs facilities for winds from 110 to 160 mph. BCE is about more than just rooftop solar farm installations, though. "We're currently developing the first phase of the 100 MW Sorrento Solar Farm in Lake County, Florida, recently ranked as the 10th largest PV plant under construction in the world with a completion by 2016." The Sorrento project required re-zoning and land-use approvals and BCE is constructing a 20-foot wide buffer all along the outside perimeter next to residences, heavily landscaped with trees and shrubs to provide an aesthetic screening. "One of the fortunate things about solar farms is that they're quiet," says Henson. "They don't use utilities; they don't create and generate traffic. So, they're very good neighbors." In addition to Sorrento, the company is also excited about the new addition to ASP's PV product lineup—the first American made bifacial, dual-sided glass PV module, which debuted in July at Intersolar North America in San Francisco. Bifacial solar panels generate more electricity by converting direct, radiant, and scattered solar energy on both the front and the backside of the module. A thinner tempered glass increases overall module efficiency by 10 percent and holographic material sandwiched between the silicon and EVA layers maximizes the time per day the modules can generate electricity from the sun. Combining these and other innovative elements, the energy output is as much as 30 percent higher than conventional technology. It's an exciting time for Bluechip Energy with new products, rooftop installations, and soon one of the largest solar installations in the nation. "In the last three years, we've doubled our staff and facilities," says Hefler. "When I started with the company in 2010, there were 20 people and now there's 200. We've created lots of jobs in the clean energy environment in a relatively stagnant economy. Because we do everything from manufacturing to project development to engineering and construction to electricity sales, there are a lot of opportunities being created." The company is having a few growing pains—like finding technical designers and qualified installers for solar facilities in central Florida. "Thermal solar expertise has been around for a while, but the solar electrical business is fairly new," says Henson. At the end of the day, though, there are no complaints about the company's rapid growth. "We have come a long way considering our manufacturing jump started in 2009," says Hefler. 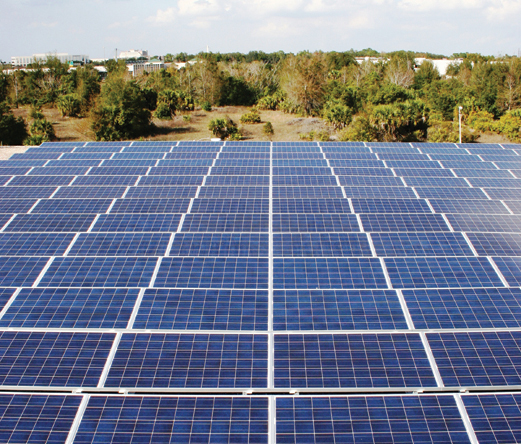 "Now, in terms of production capacity, we're one of the largest manufacturers of crystalline silicon PV modules in the U.S."
Henson adds, "We're proud of what we do to not only help the environment with innovative products and services, but also that we've been able to create economic vitality for our own central Florida communities. We're creating jobs for people in a field that is expanding and has a very promising future."